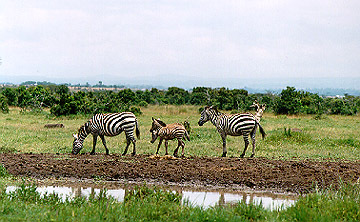 Sweetwaters is a private game reserve near Mount Kenya. 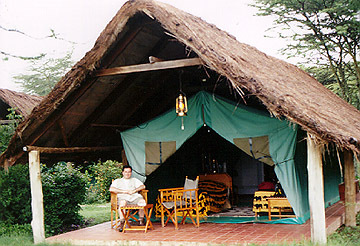 The Sweetwaters Tented Camp is located inside the reserve and is protected by a small ditch and electric fence to keep the animals out and the people inside. The guests sleep in tents but these are not the average tent. The permanent tents are on raised wooden platforms and each has electricity, bed, running hot and cold water, desk and private verandah. Most face the floodlit waterhole and since the low fence and ditch are hard to see, it seems like one is with the animals. I guess one could easily step over the ditch and fence but that is not recommended. When not with the group, I spent my time hiking in some of the bushes at one end of camp or relaxing on my verandah and watching the zebra and other animals. Other people relaxed at the swimming pool. At night, I was awakened by a herd of cape buffalo who came to the waterhole to slosh in the mud. Here is my tent which faced the waterhole. The rhino bedspread is a bit tacky but the bed was comfortable. Blankets were required at night since the weather was cool. I saw these zebra from my verandah. They are plains zebra. I don't know how old the babies are. 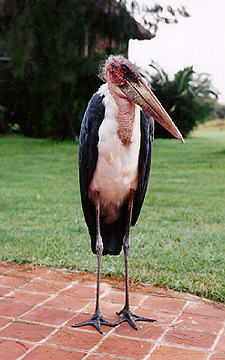 This marabou stork came up to the window during lunch. It must like buffets. Morani is swahili for warrior but Morani the black rhino is quite tame. His mother was killed by poachers years ago when he was a baby and he was raised by people. Now, Morani can't live with other rhino because he is now like a pet. He spends his life sleeping and getting fed by visitors like myself. He has very rough, leathery skin. Even on the private reserve, he must be under 24 hour armed guard because of poaching. His horn is valuable and given the chance, they would kill Morani for his horn. 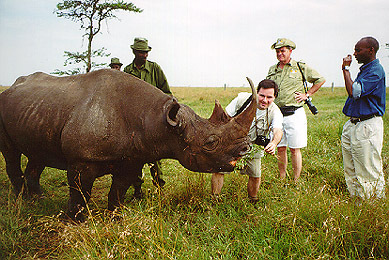 The majority of back rhino have been killed in Kenya and the species is in danger of extinction. 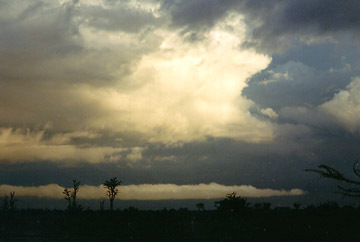 An evening thunderstorm at Sweetwaters. The long narrow cloud is a roll cloud, formed from rain cooled air moving away from the base of the storm.